Okay, so I’ve ruined my fair share of cookies. It’s hard to admit, but I’ve been the impatient baker whose cookies spread clear across the pan, uniting in some sort of evil oven uprising. I’ve managed to create the salty, the gravelly, the misshapen, the tooth-breaking, the debatable, and even the inedible (rare, but it happens!). I’ve even “baked cookies” that somehow didn’t seem to bake at all, as if they just completely gave up on me (maybe not a terrible decision after all). And every once in a blue moon, I hit a mean stroke of luck and craft the buttery, the perfectly crisp, the slightly chewy, the flavorful . . . the perfect total fluke of a cookie. I can’t even begin to tell you how I get it right when I do or where I go so terribly wrong all the other times. What I can tell you is this: I might be on the path to cookie righteousness now, thanks to a cookie baking course I attended at Casual Gourmet. Since this was my first cooking class, I wasn’t exactly sure what to expect. I sort of imagined this very stern chef who would shout things like “Crème Anglaise!” and “Boulangerie” as the class nodded their heads in amazement at the knowledge flowing around us. All of that went out the window when I met Chef Troy Camacho, a clearly passionate, high energy chef, who immediately asked if I was looking for the “Taco Making Class,” an introduction that really set the stage (table?). Before class started, Chef Camacho set aside time to answer questions from attendees—everything from halving eggs in recipes (no, it’s not an enigma) to lasagna tricks to what just a pinch of cinnamon can do for your icing. 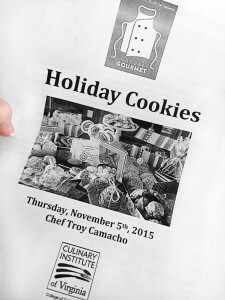 He talked about common cookie woes and told a few funny stories about his experience as a chef instructor. That’s right – as Chef Camacho said, “Don’t be afraid to mess up—it’s not one and done. If you mess up, we’ll figure out how to fix it or we’ll scrap the batter and start over. Easy.” Or, something like that. So it was time to make some (hopefully) failure-free cookies! 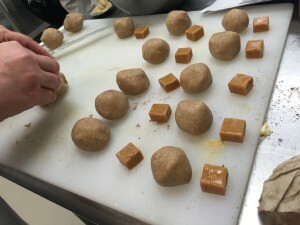 Covering five recipes in two or so hours is a feat for sure, but I think everyone found the challenge much more manageable—and probably a bit more enjoyable—working within teams. Everyone was split up into three to four students per station where they’d be working together to create their confectionary masterpieces. Navigating a commercial kitchen could prove to be a bit overwhelming, so I was happy to see mounds of ingredients already set out for each station—from flour and sugar to the largest bricks of butter I’ve seen in my life. 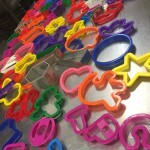 There was an entire work station filled with cookie cutters (trees, animals, letters, shapes . 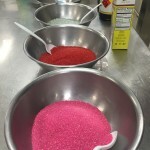 . . you name it) and another work station with enormous bowls of colored sprinkles alongside a slew of food coloring and a few types of jelly. There were tools in every direction, from sheet pans and whisks to rolling pins, spoonamajigs, and other things that will have to remain nameless. Everyone got right to work, prepping and mixing ingredients while Chef Camacho and a couple of assistants helped with techniques, questions, and general instructions. Holiday music was played, chocolate was chopped and thrown into the double boiler, butter was creamed, and the Kitchen Aid mixer was tested and compared against hand mixing techniques. We might have even see Chef Camacho dance. We definitely saw Chef Camacho dance. 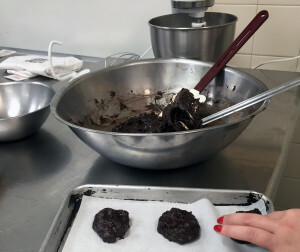 Surprisingly, one of my very favorite parts of the Holiday Cookies course (aside from the sweets) is that everyone was learning these hands-on skills to take home and use, but with the luxury of having a classically trained chef at their beck and call. 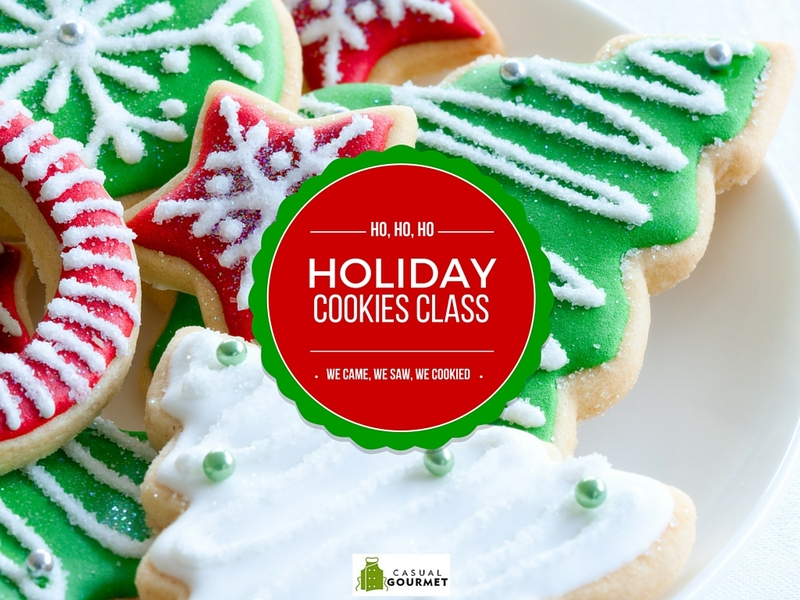 I don’t know about you, but at home, it’s pretty infrequent I have someone in the kitchen who can show me how to separate an egg or use a French roller, tell me about differences in types of flour, or explain how overmixing cookie dough can produce unexpected results (and why)! I even got to see the many wonders of parchment paper, learned how to tell when a cookie is ready to come off the pan, and saw how important temperature is, both hot and cold. And I learned the likely reason why my homemade cookies turned into an evil glob—can too much sugar really be a thing? 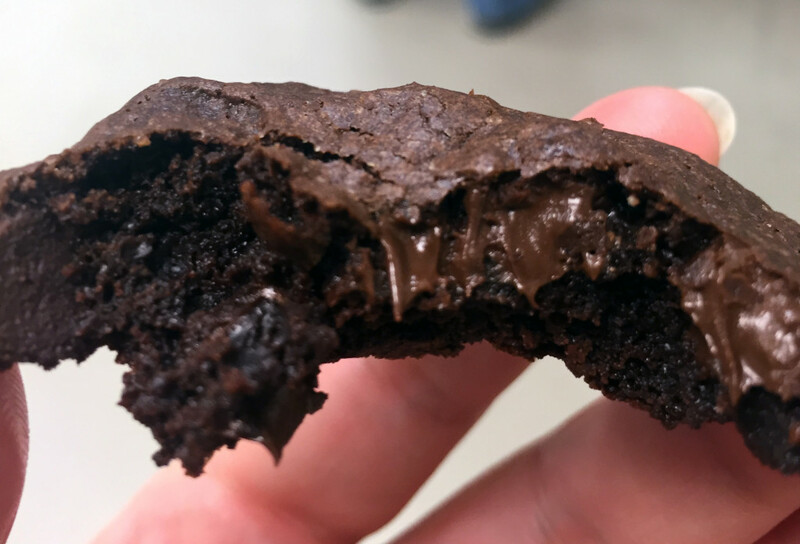 The perfectly cooked chocolate cherry cookie, which was quite literally beyond belief for my taste buds. 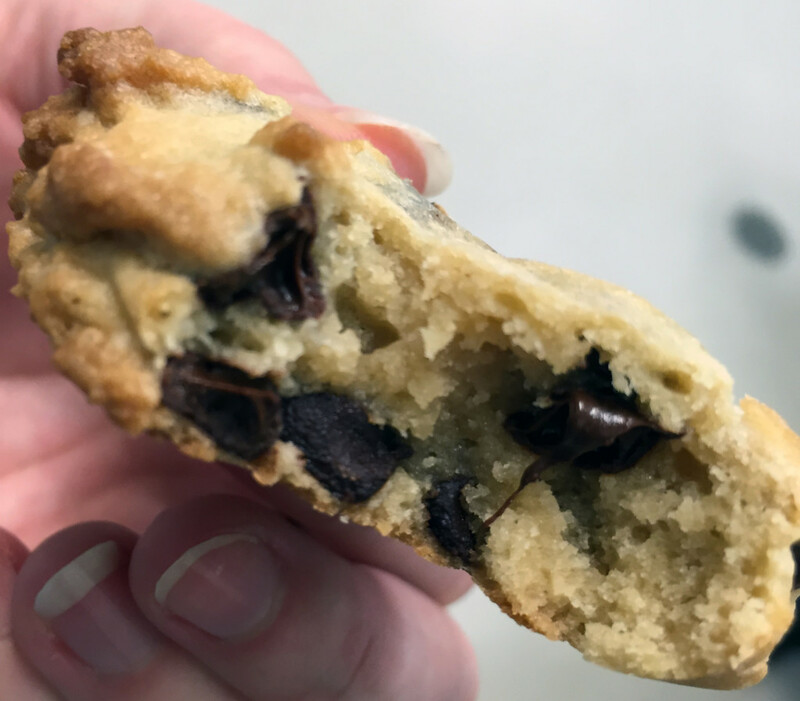 Classic Chocolate Chip with a twist – they were cooked PERFECTLY! 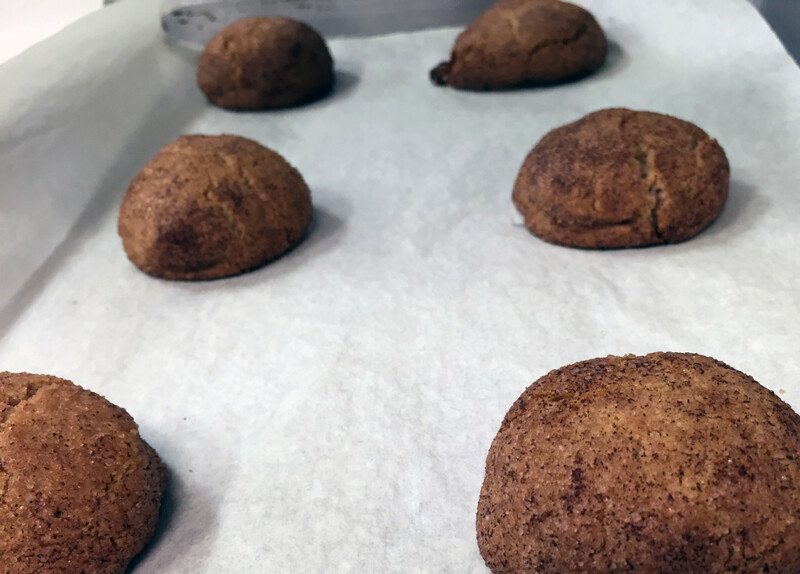 We definitely upped the Snickerdoodle game with a melted caramel center. 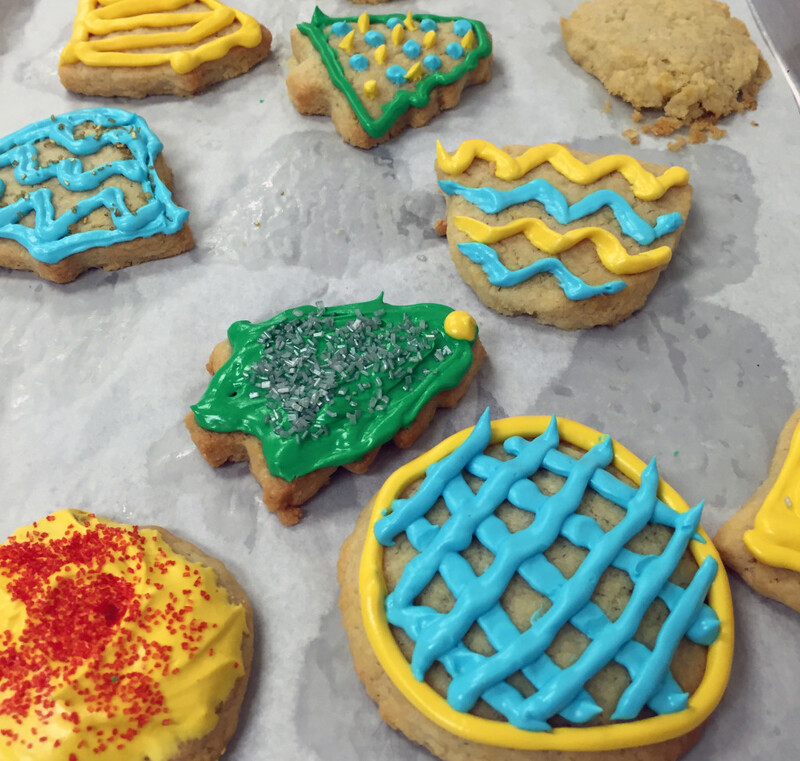 Gorgeously decorated Sugar Cookies – a classic favorite. To get right to the point, the question isn’t if I’d go back—the question is definitely “How soon can I go back?” and I’m hoping that answer is immediately, if not sooner. There’s just something beautifully liberating about a perfectly baked cookie after so many unfortunate uni-cookie catastrophes.